Bots continue to evolve as attackers find methods to bypass existing protection. With its sophisticated web behavior technology, PerimeterX Bot Defender is poised to stay ahead of the evolving threat landscape. 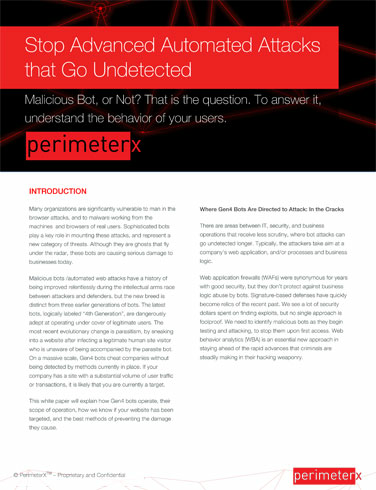 By focusing on the behavior of humans, applications and networks, PerimeterX Bot Defender detects automated bot attacks against your website with unparalleled accuracy. Instead of using signatures of existing bad bots, PerimeterX Bot Defender builds dynamic profiles of normal user behavior. Our bot detection tool combines that data with browser and session activity patterns to identify malicious bots and catch them—no matter how many times they change their IP or approach. Sophisticated hackers exploit organizational gaps between business functions and information security, leaving you defenseless. Whether account takeover, checkout abuse, scalping, scraping or ad fraud, PerimeterX Bot Defender protects your website and your business. 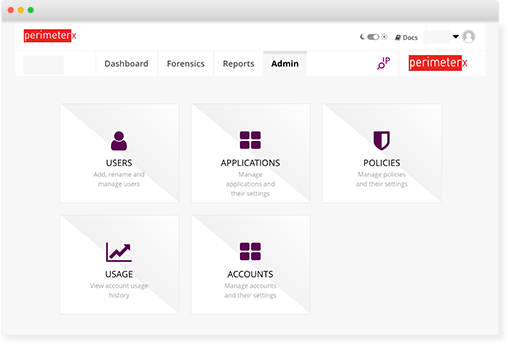 PerimeterX Bot Defender is compatible with your existing infrastructure, including on-premise, cloud and CDN. What’s more, you don’t need to invest in hardware or deploy as an appliance or proxy service, or be placed inline of website traffic. You can deploy seamless protection within minutes. PerimeterX Bot Defender is built with the flexibility to enable DevOps teams to control and manage the service based on real-time information. With its easy API integration and ability to work with any existing infrastructure - CDN, ADC, load balancer, application or web server - PerimeterX’s bot detection tool, Bot defender, helps you block threats in real time. 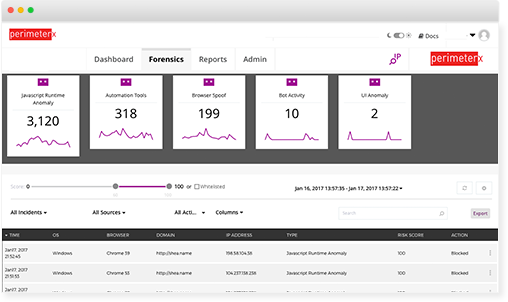 Get instant visibility into your security posture with reporting and deep forensics. Filter based on parameters including time and risk score, country, IP, or your own custom parameters.